Witamy! How was your Easter holiday? Did you have Polish Easter lunch, or Easter dinner? Did your family hold to any of the traditions? Our dinner was late this year, about 5 PM, and pretty casual. Family had been driving most of the day and there just wasn’t much time to put together a full-up festive feast. Except for the addition of our American favorites such as cheesy potatoes and scalloped apples, our meal was still pretty Polish. We had a spiral sliced ham which was garnished with Cwikla (shredded beets and horseradish), and Polish sour cream mustard sauce and Laura made a bowl of traditional vegetable salad. These all came from straight from our book and from Babcia’s table over one hundred years ago. We shared the egg with Easter wishes, and our little granddaughter proudly said “amen” at the end of the blessing. But I have to be honest with you...the next few days after the main attraction are tasty as well because Easter leftovers can be amazing. Since most of the dishes are served cool or at room temperature, snacking right from the storage containers in the fridge is absolutely allowed. For several days my spoon never leaves the counter next to the fridge. To that end we’re now more strategic since we buy our ham about 50% larger than needed on the day of the big feast. 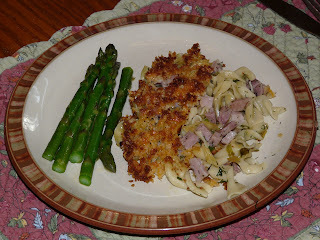 One of our favorite ways of using up extra ham is in fact a very traditional Polish dish – ham and noodle casserole. Full of fragrant dill and topped with a crusty lid of breadcrumbs hiding chunks of ham and buttery noodles, Laura has taken the heritage recipe to the next level, and it’s pretty gosh darn good! Smacznego! Mix the noodles with the ham, bacon drippings, green onions and dill and place in a oven-safe baking dish. Mix the breadcrumbs, butter and grated cheese and sprinkle over the top. 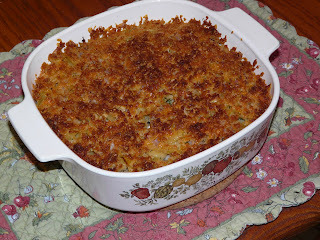 (Note: add more breadcrumbs if the topping seems too wet or mushy). Bake at 400 °F for 35 minutes. At the end, put under the broiler for just a minute or two to toast the breadcrumb topping until golden. Pair with your favorite green vegetable. Washes down very nicely with tomato juice, a light beer or slightly sweet wine such as Reisling or Pinot Gris.